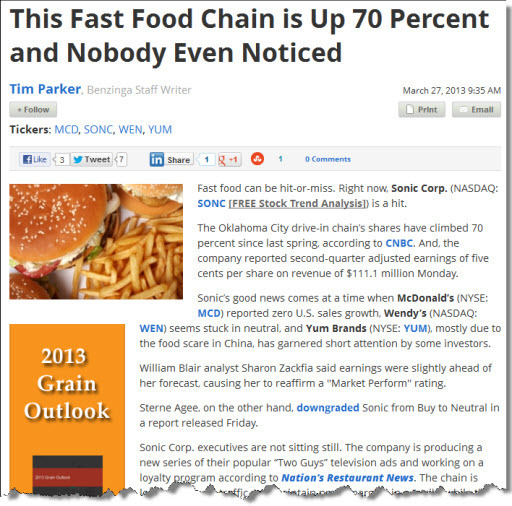 Sonic Restaurants (SONC): Did We Notice? Tim makes an interesting point and nudges us in the direction of an important question. It’s not so important where Sonic Restaurants (SONC) are today in terms of expectations — although if you hold/follow SONC, you want to know that the return forecast is now 2.5% (thanks to the price surge brought to our attention by Tim) and that the company has a below-average quality ranking. But we have to wonder whether we “noticed” Sonic before the price move? 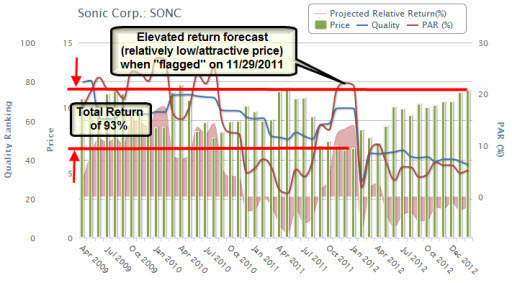 As shown on a current chronicle for SONC, the return forecast was elevated at stock price of $6.71 and the projected annual return was approximately 20-25%. 1. The disruption period following the early 2005 relative strength break (RSI declining to less than 70 after a sustained period above 70) is not something that would surprise us. 2. The death cross (short-term trailing average breaks below long-term trailing average) circa Halloween 2007 basically “intervened” and disrupted (BIG) any potential recovery following an oversold break to the upside. As is often the case, carnage ensues — and carnage is exacerbated for poor and average quality stocks. 3. SONC was stuck in the carnage zone until a series of higher lows in the relative strength index (confirmation) materialized in late 2011. We don’t operate under any pretense that we’re right all of the time. (Our target is to select outperforming stocks 60% of the time or more, that’s sufficient for differentiated superior performance — and can produce 3-5 percentage point relative returns over the long term.) But we do like to check historical “flags” and selections to see what we can learn. And that learning often includes huge doses of humility. We’ll be looking at some analyses that didn’t work out quite nearly as well … and seeing if dining on a little crow can bolster our long-term investing efforts too. March Madness? Bring Out Your Dead. This week’s Value Line update includes quite a surge for a number of companies. Take a look at the accompanying “Materially Stronger” list in the 3/29/2013 update. As a reminder, an appearance on this list means that the Value Line analyst has “step changed” the long-term low price forecast by 20-25% since the last report 13 weeks ago. And in the case of Issue 6 companies — relatively few of them are in our sweet spot or better, AFTER the bump. But they’ve gone from a return forecast dripping in red ink to in most cases, low to mid-single digits. Insert [Value Line analyst] for CUSTOMER and you’ve got a pretty good rendition of the situation for many of the Issue 6 companies. We have no difficulty imagining the gaggle of Issue 6 analysts in a group huddle with someone in a leadership position imploring the lot of them that these stocks aren’t dead yet. And the result of that group hug was a collective reassessment of expectations for the materials and homebuilding companies in their coverage. In defense of the analyst gaggle, analysis of companies that have been subjected to a depression is quite challenging. The difficulty factor that accompanies normal cycles (variable frequency and amplitude) is compounded by a bath tub effect where it becomes difficult to envision “the other side.” We talked about this during the March Round Table citing conditions at Bank of America (BAC). In a nutshell, the banking industry went from a collective return on equity (along with significantly damaged book values) of 15-20% to 0-5% during the Great Recession. Many have recovered or are expected to recover to the 8-10% range — but it’s still a mystery as to how robust or rapid the recovery will be … or whether historical levels will ever be seen again. Note the frequency of oil & gas field services along with a integrated petroleum company among the results. The information technology companies (INFY, AAPL and INTC) continue to be prominent as well. During the March 2013 session of the Round Table, our noble knights (and fair damsel Anne Manning) elected to close out (“sell”) the positions in Adobe Systems (ADBE). 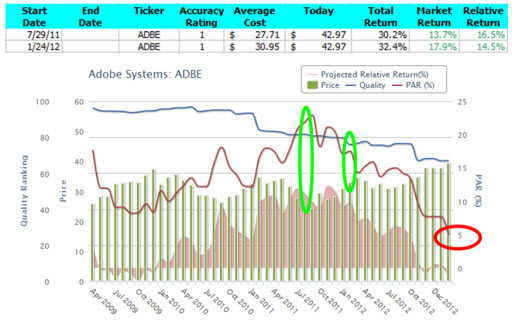 The annualized relative return achieved on the selections of ADBE by Anne Manning and Ken Kavula was +16.5% and +14.5% respectively. Huzzah and thanks, Anne. Bank of America (BAC) was also batted about. The fundamentals have been a wreck and they’re still impacted by the Great Recession. 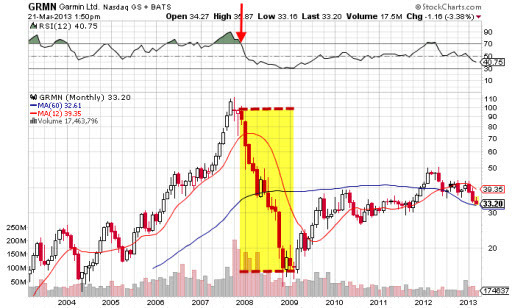 Book value was hammered and is still recovering — a condition quite widespread amongst all banks. Return-on-equity (ROE) has been staggered and perhaps somewhat permanently altered. In the case of BAC, a quick sensitivity analysis on two different thresholds for projected ROE illustrates how muddy and choppy the waters still are for BAC. Hugh also noted the cobbled-together nature of many of these banks since 2008 during the crisis and that spinoffs and restructurings probably hold fairly promising — and quite confusing — potential. Where do you think ROE levels for banks in general are headed? 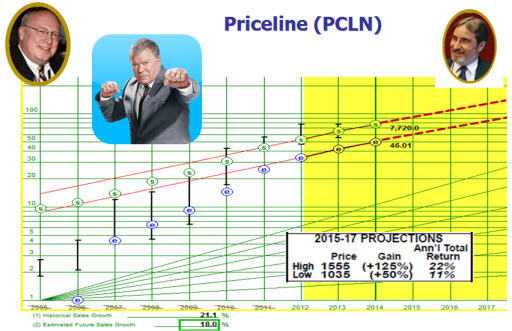 In celebration of William Shatner’s 82nd birthday, Ken and Cy added Priceline (PCLN) to the Round Table tracking portfolio. Continuing with the theme of mayhem and madness, Hugh and Mark also agreed on a selection (a condition that we’ve rarely seen amongst all the knights over the last three years) and presented Intel (INTC). Hugh shared some thoughts on diving beneath the surface of customary analysis to take a look at inventory trends. If you’d like to hear Hugh expound on this theme, let us know and we’ll schedule a webcast to share legendary tales of companies like Lucent, SafeSkin and Cisco Systems. 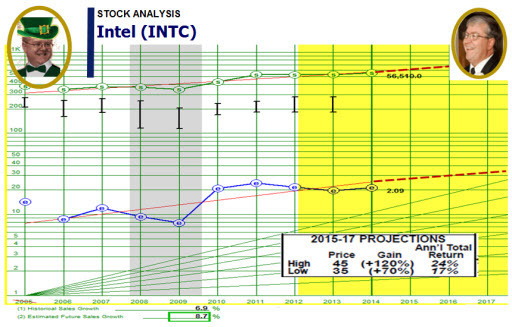 The road ahead for Intel is not without a speed bump or two as the transition from PCs to other devices and hardware continues. The company always has been and likely will be, a growth-cyclical, and it will likely remain that way with a long-term growth trend in the 6-8% range for the foreseeable. But it’s a clear leader in its industry with solid margins. 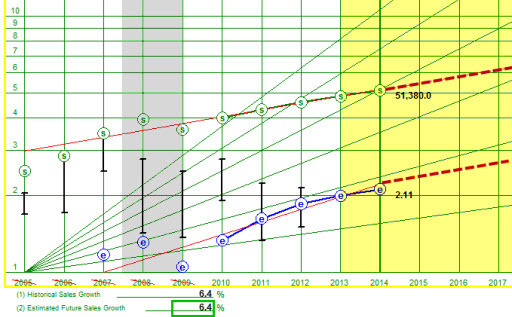 As shown here, Value Line has the long-term low total return forecast at 17% — not too shabby. The audience closed the session by voting for Priceline (PCLN) over Intel in a clear birthday cake tribute to Captain Kirk — and price negotiators everywhere. Guggenheim closed down a couple of the equally-weighted ETFs that we’ve been using to passively emulate the Value Line 1700. As shown here, you’ll see that they served us well for Balanced Budget and we’re sorry to see them go. We’re attempting to come up with some sort of investable alternative. Whoa. We’ve not seen a listing for “Materially Stronger” like that in quite a while! But keep it in context. Despite significant strengthening of fundamentals, virtually none of these show up on the study target list. And in fact, we had to stretch the parameters in order to have a list. We made an exception for Blyth (BTH) because usually a quality ranking of 14 would normally keep it off the list. But the return is speculative and if you can build a case for a turnaround, BTH could be worth a closer look. BTH is clearly a restructuring-in-progress. Fluor Corp (FLR), a Beardstown Ladies favorite, is here as a reminder. Some of you may recall that the Ladies continued to hold FLR despite a low single-digit PAR a few years ago (something we explored during a Dashboard Diagnostics webcast). The reminder is that stocks can stay overbought for a long time — but that vigilance, and in some cases, protective measures can be prudent. Sonoco Products isn’t about gasoline and it’s a good study although probably worth waiting for a stock price dip before getting wrapped up in it. The median Value Line low total return forecast is 6.8% vs. 6.8% last week. As the first quarter of 2013 comes to a close, it’s probably time to check in on our run-for-the-hills indicator, the track record for new highs vs. new lows. Despite the generally bullish and potentially overbought general market, there’s no reason to load up the family truck and head for the hills, Beverly or otherwise, Jed. 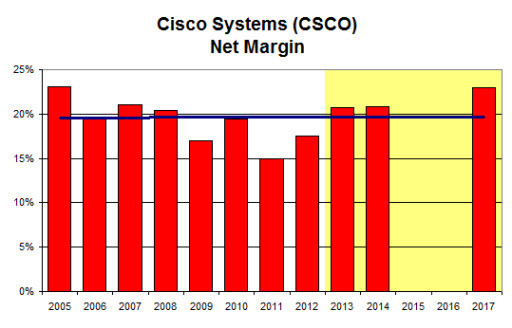 Cisco Systems (CSCO) appeared in this week’s update under the flag of “Materially Stronger” and at the same time was mentioned in a series of articles that called into question the long-term viability or sustainability of some of their product lines (hardware). We talk about threats and opportunity analysis a fair amount here, so it seems like a good time for a deeper dive and closer look at Cisco Systems. The company is #11 in the MANIFEST 40 so it’s no stranger around here. CSCO also serves as something bigger than a poster child for rhino confusion. Why? Because when the stock price reached $80-90 back at the advent of Y2K, the company was the most STRONGLY RECOMMENDED stock on Wall Street at a time when our return forecasts were screaming SELL based on a DOUBLE-DIGIT NEGATIVE PAR! 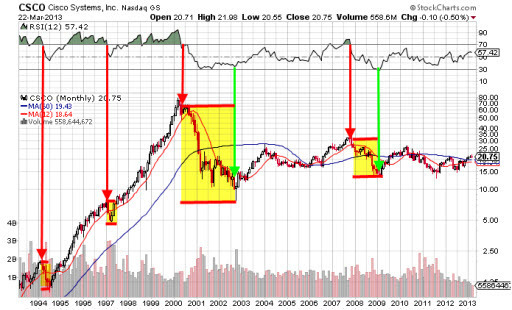 The CSCO situation (and madness) was the centerpiece of an article I wrote for Better Investing at the time. Let’s break it down. First, “Materially Stronger” in our weekly updates simply means that the Value Line analysts have given the long-term low price forecast a significant boost. What is significant? We’re watchful for 20-25% step changes (up or down) and we share these as “flags” with our community. 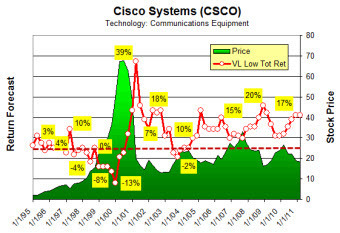 The long-term low price forecast for CSCO of $30, translates to a long-term low total return forecast of 11.7%. Under assumptions of a 6% sales growth forecast, a projected net margin of approximately 20% and an average P/E expectation of 13x, a case can be made for a projected annual return of 11.7%. FBR Capital downgraded Cisco (NASDAQ: CSCO) from Market Perform to Underperform with a price target of $17.00 (from $22.00) saying routers and switches hit a dead end. Now I don’t know anything about the track record of FBR Capital. It’d be bolstering if we had any idea how their opinions translate into long-term results, but we don’t have that. What we have is a threat to profitability at CSCO. We could nutshell and capture this question with a potentially-similar situation from a few years ago. A number of community members at the time cautioned us to avoid the rosy consensus at one of our favorite companies. They urged us to consider reality. We ignored them (a little) at our own peril. So the question is: Is Cisco Systems exposed to the same type of threat to product, inventories, profitability AND STOCK PRICE as we saw with Garmin? So it’s back to Cisco Systems. And now we’re gleaning through the most recent quarterly conference call transcript looking for signs of things related to (1) threats to forward profitability and/or (2) anything specific about this software-defined networking. CSCO has the cash and the track record. They’re actively responding to the challenge. If you hold CSCO, be vigilant for slippage in profitability. Be aware that the global recession will certainly lead to some weakness as the worldwide economy cycles. Here’s a slightly elongated look at one of our newly favored 10-year charts, displaying the 1990s. If you were there, you remember the 1990s. This again shows how resilient an excellent company can be in the aftermath of a corrective disruption. By the way, that 1998 contagion thing was more massive than very many of us remember. Most of us were too busy being rationally exuberant at the time. And we close with a current chronicle going back a few years for Cisco Systems (CSCO). The quality ranking is virtually top shelf with no signs of weakness. If profitability slips (vs. peers/competitors) the deterioration will show up in the quality ranking. The return forecast is not exciting — equivalent to a fairly solid “HOLD” for most portfolios at approximately 11-12%. And we also see that patience can be rewarded with a return forecast closer to 20% from time-to-time. The time to accumulate would be then. 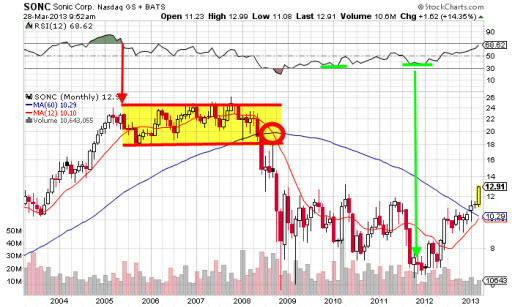 For Cisco Systems (CSCO): Watch carefully. Wonder. Wait.